“Baku Shipyard” LLC will build two more Ro-Ro type vessels for “Azerbaijan Caspian Shipping Company” CJSC. Head of Strategic Planning and Development Division of Baku International Sea Trade Port Khudayar Hasanli said this at a training organized for journalists. He went on to say that these vessels will be able to transport 50 TIR trucks, 44 freight cars and 100 passengers, adding that trucking TIR through Azerbaijan has recently declined. “Earlier, because of the problems between Turkey and Russia, the cargo was transported across the Caspian, now the countries have established relations, and the traditional routes have resumed, however, our transportation is still relevant,” he stressed. The representative of the Baku port also said that in the first half of the year passenger traffic increased by 37 percent compared to the same period last year. Vessels of RO-RO type are vessels with a horizontal cargo handling method. 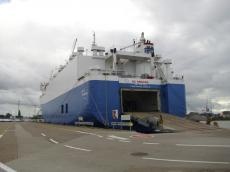 They are intended for transportation of the cargoes and also for transportation of cars, trucks, trailers, semi-trailers and wagons, which are set in motion and leave the ship on their own. The cargo handling capacity of the port, opened on May 14, 2018 with the participation of President Ilham Aliyev, within the first phase is 15 million tons, including 100,000 containers per year. Seven of 12 existing berths serve dry cargo ships, two berths - ferries, two more berths - Ro-Ro and Ro-Pax vessels.